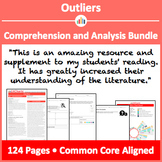 Nonfiction/Informational text novel resource packet that includes anticipation guide, preview activity, daily lesson plans, chapter summaries, discussion questions, text feature guide, and a list of activities to complete with students. This 15 question multiple choice quiz is designed to test students' understanding of chapters 3 and 4. 10 Study Questions of higher quality and "common core ready" on Outliers, Malcolm Gladwell's informational text. A short, simple set of questions/prompts to promote discussion prior to reading "The Outliers." I use this before we read the book to get the students to analyze their definition of success and to look at how each person's definition of success can be quite different. This 10 question multiple choice quiz is designed to text the students' understanding of the reading. This 10 question multiple choice quiz is designed to test students' understanding of the reading. Answer key provided. In order to start each class, journal entries reflecting on the main ideas and arguments are helpful to engage students. 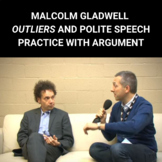 These eight journal entries can serve as warm ups in order to incite meaningful conversations with students about Outliers by Malcolm Gladwell. This is a multiple choice quiz on chapter three that requires students to be able to determine the central idea of the test, and recall an objective summary. This multiple choice quiz is designed to test students' understanding of chapters 5 and 6. A worksheet where students can do the math to determine if THEY are a master of their favorite activity! 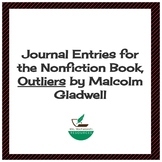 Ten thoughtful, high skill, "common core ready" study questions for the nonfiction book Outliers by Malcolm Gladwell. 10 Study Questions of higher quality and "common core ready" on Outliers, Malcolm Gladwell's informational text. The last question could be used as an ending essay question for the unit.